“We the Party” is a stylish, fly-on-the-wall look at modern high school life, mostly in the tradition of the big party/John Hughes feel, and coming of age through a series of unexpected events. Mario Van Peebles son, Mandela, plays the lead role of Hendrix Simmons, part of a group of close-knit friends who are participating in the realities of the current high school scene – with the new interactions of technology and multiculturalism – through to the normal adolescent rituals of prom, dating and trying to fit in. The high spirited cast and production has a swagger that conveys a youthful energy and more importantly, an empathy. Mario Van Peebles expresses that energy in his own right, having been an actor, director and producer. He made his film performance debut as a child, playing young Sweetback in his father’s seminal 1971 breakthrough, and went on to significant roles in television and movies from the 1980s onward. His directorial debut, “New Jack City” (1991), was a sensation upon release, and his filmography from there includes the incendiary “Panther” (1995) and “BAADASSSSS” (2003). The latter film is a chronicle regarding the making of “Sweet Sweetback’s Baadasssss Song,” in which Mario portrayed his father. He is currently set to direct some Season Two episodes of “Boss,” the Starz cable series starring Kelsey Grammer. HollywoodChicago.com: You were born in the 1950s, but are commenting on the current high school youth in ‘We the Party.’ What kind of anthropological journey did you have to take and who helped you the most in that quest? I remembered the film ‘House Party’ , which was a lovely film, rated ‘R’ and with an all-black cast. And then there were the John Hughes films, ‘Sixteen Candles,’ ‘The Breakfast Club,’ also rated ‘R’ with a lot of heart and all-white cast, and ‘Stand and Deliver’ was all Latino. So I thought in 2012, let’s mix this up. I had my in-house think tank with my teenagers, and when they wanted to go to the parties and clubs I asked to come along. That didn’t go over too well, so two of my sons said why don’t you go not as our Dad but as an ancient member of our entourage. The deal I made with them is that they were allowed to do their thing, and I just wandered around. Van Peebles: Well, I had hippie parents and I hitchhiked with my Mom to see the Rolling Stones at Altamont and my Dad knew the Black Panthers, so I became that parent as well. I’d rather know what my kids are doing than not, so a lot of it came from real situations and real life. When art imitates life it’s fresher, more interesting and more authentic, and sometimes real life imitates your movie. HollywoodChicago.com: Your film is optimistic about today’s youth, but you don’t pull any punches when it comes to showing the party, drugs and sexuality of that age group. Are you essentially telling people that it’s best to let kids be kids at that age? Van Peebles: It’s funny that you say optimistic, because in someways ‘yes,’ but someways ‘no’ as well. I probably feel both. The film was born because I invited people to be a part of it, who knew they weren’t going to make money. It’s a potluck, as in I was inviting everyone to dinner, but not providing the food. It was ‘you bring something, and someone else brings something’ and we’ll see what we get. When Snoop Dogg rolls in, he brings his kid and Sally Richardson brought her love of kids. Those people are going to have a natural optimism anyway. But in the context of the film I want to continue the conversation in the film with my kids and the young audience that society has already started talking to them about hyper-sexuality, hyper-materialism and commercial messaging since they were young. And in that sense maybe they can’t buy themselves at the mall, maybe people that you should respect the most are not big shoppers and sometimes even died for something. One boy in the film stands up and says we’re seven billion people on this planet. Scientists says we can hold nine billion, but we all live like Americans we’ll have the eco-footprint of 18 billion. That’s not the stuff you hear in a kid’s movie, but it is something you hear in the context of their lives. These kids are being raised in a new earth consciousness, and there is an optimism to it, and that is played forward. HollywoodChicago.com: You have some really expressive techniques in the film, using many of colors on a director’s palette. What inspires you to create different filming styles or techniques once you’ve completed a script and are working on it with your Director of Photography in pre-production? Van Peebles: Again, I went back to the kids. I’m not a big multi-tasker, but I looked at what my kids and their friends do, when I’m talking to them they’re on Facebook, the computer, listening to music, all extreme multi-tasking. They do it pretty well, I have one son that listens better not even looking at me. So in filmmaking, I wanted it to come from this generation, who knows with their energy that they can do good and bad so quickly. It’s at a viral speed right now. I wanted it to have that speed and color, even though you went from scene-to-scene. One scene might be warm, and then you go to the prom and it’s peacock green. We picked out specific color patterns and music movement – a fabric that is interweaving, that is all part of the storytelling and narrative. I wanted it to have a visual kick. HollywoodChicago.com: The kids in the film are dealing with so many issues in this post Obama, technological age, and are portrayed primarily as upper middle class. How much does class determine the fate of an individual in today’s society, in your opinion? Van Peebles: I portrayed Baldwin Hills High is an interesting microcosm of humanity, because it’s three schools in one. It’s a performing arts school, a brainiac magnet school with those upper middle class kids and it’s a public school, with the hard working blacks from south of Crenshaw. We used kids from those different places playing themselves. What was interesting that they paired up on the set in those socioeconomic groups. As hunter-gatherers, we have a natural tendency towards tribalism. In nature, the land supports about 40 or 50 people together, so if 100 show up we tend to split into two. It’s the way we are. We’ve developed faster socially, but not biologically. Once you understand that if we were all purple, we’d divide into a different groups of purple, like the brown Muslims and Hindus in India, and the white Catholics and Protestants in Ireland. Once we start to look more like each other, we’ll still profile. It’s just that the profiling will be along another line, religious, socioeconomic or something else. That’s just part of our thing. HollywoodChicago.com: You recreated your father’s journey as director and creator in ‘BAADASSSSS!.” What trait of his being or personality did you project about him that you had observed in growing up with him, and did you tell him about that trait or keep it a secret in your performance? 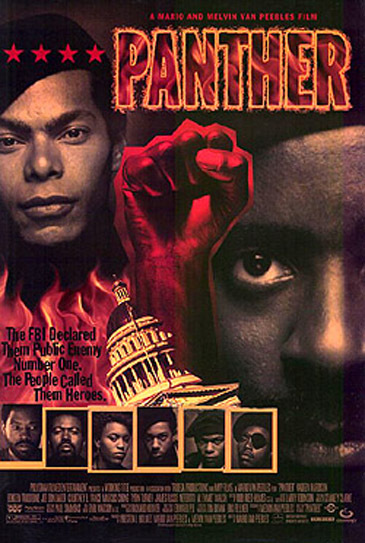 HollywoodChicago.com: You also did the quasi-documentary film “Panther” in the mid-1990s. What is most misunderstood about how you approached that film? Van Peebles: There was a theme, that also comes out in ‘The Godfather,’ if you’re going to get into the dirty business of drugs, keep it in the black communities. Once you understand that, the logistics of getting those drugs into those communities creates ‘self-cleaning ovens’ by clearing them out through arrests, again and again, it is a big part of why we are and where we are now. And in those communities we know that failing schools equals very successful prisons. It’s a sad cycle, and in ‘Panther’ we go into the genesis of what happened with that and how the drugs started to come in, to medicate what J. Edgar Hoover feared was black militancy. They ‘medicated’ those communities with drugs. HollywoodChicago.com: You and President Obama are of the same generation, shared a mixed race heritage, but have taken different journeys through the lifestyle and attitudes of America during your developmental tracts of the ‘60s, 70’s and ‘80s. How do you feel you most closely understand the president’s journey, and what would you tell people who don’t understand that or dislike him just for the color of his skin? 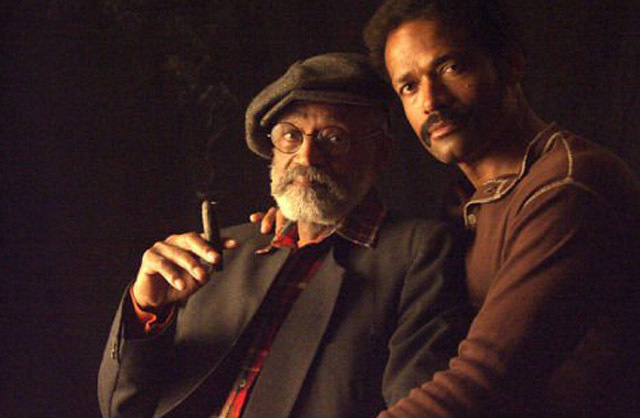 Van Peebles: I always viewed my multi-racial heritage as a great advantage, but then again I was born in Mexico, we lived in Europe and I speak Spanish, French and Ebonics. We enjoyed being citizens of the world, and that is the future for sure. Dr. King said we either learn to live together as brothers and sisters or we perish together as fools. We’re really getting stuck looking at our own navels about this stuff, and we have bigger things to deal with, so I hope we get past this silly stuff. If we stay divided, we’re missing the point. Submitted by LUIS CENTENO (not verified) on September 17, 2012 - 1:31pm. I just want to thank you Mario, for the opportunity of working on BOSS on episode 204,206. I really had a great time.